Curt and unfriendly, the woman is convinced her pet has been stolen but once behind her heavily-bolted door, Hamish can spot her true problem - she lives in fear, though of who or what he cannot guess. Then someone steals a Christmas tree and lights from the nearby village of Cnothan. So it is up to Hamish to sort all these problems out and he had better do it quickly, for the church bells will soon peal on the eve of Christmas. M. C. Beaton worked as a Fleet Street journalist. She is the author of the Agatha Raisin novels, the Hamish Macbeth series and an Edwardian murder-mystery series. She divides her time between Paris and the Cotswolds, where she lives in a village very much like Agatha Raisin’s beloved Carsely. If you like Hamish Macbeth, then you'll like this story - just note that if want to listen to stories in order - this is not 1.5 (which sounds like it comes between book 1 and 2) - it's written at a much, much later time in the series. Confusing if you're expecting chronological order. What did you like best about A Highland Christmas? What did you like least? It was a gentle story, set in a fictional area of the Highlands. If you're looking for the polar opposite of "The Girl With the Dragon Tattoo" this is it. It was a bit sentimental at times. I listened to this as an easy first attempt at audiobooks and hated it. terrible, boring story. a waste of a few hours of my life. I usually love MC Beaton's books, but this one was very short and, for me, far too full of good cheer. We all enjoy some good cheer over Christmas but this was just one long saga of everyone, even the bad tempered ones, being so full of loving kindness that it was rather like tucking in to an over sweet trifle. I hoped that there would be some sort of mystery to add as a counterweight, but the only trite one concerned missing Christmas lights. I got through it, as it is so short, but it wa a disappointment. loved it as usual. 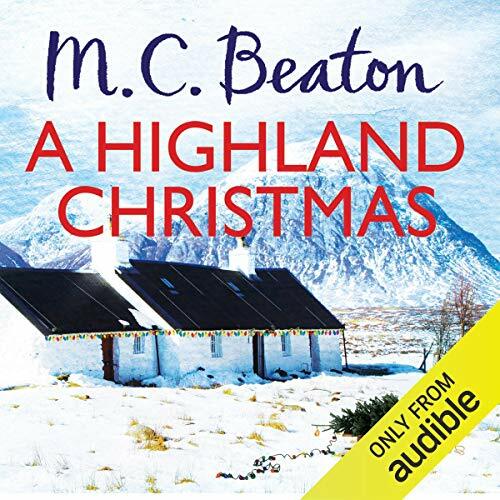 Audible library filling with all M C Beaton books. Can't wait! A story with lots of Christmas elements there is a tree and presents and an elderly character of scrounge like characteristics is shown to have a different side when given the company of a little girl who is lonely of course for some characters things do not go according to plan ! Will get you in a seasonal mood or simply act as a cheering tale if you are feeling a bit low. A little expensive for the length but lovely little story. The plot was just complicated eniugh, the annoying Priscilla was just a disembodied voice and the mystery of Lugs was solved. Really enjoyed it.